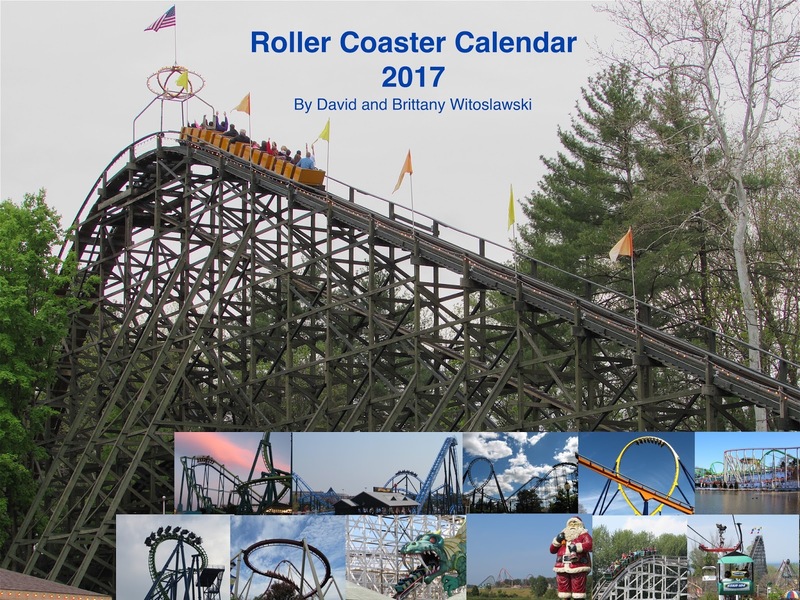 Today we are pleased to announce the release our 2017 Roller Coaster Calendar. This wall calendar features sights from many awesome amusement parks, including Knoebels, Kentucky Kingdom, Waldameer, Cedar Point, Dorney Park, Six Flags New England, Darien Lake, Kings Dominion, Kings Island, Lakemont, Rye Playland, and Holiday World. This wall calendar is spiral bound and measures in at 17 x 22. There is nothing like be able to spend about ten bucks for a full day at an amusement park, in addition to being able to get some time in at a waterpark. Lakemont is one of our favorite haunts for its terrific rides, light crowds, fun atmosphere, and affordable pricing. If you are expecting some well manicured park, with a parking fee, expensive ticket admission and meals, hour long waits, and more, then Lakemont is not the park for you. If you like going to a park to get actual ride time, without having to pay for parking, and paying as little as $5.95 on weekdays, and $10.95 on weekends, to ride everything, then Lakemont is a place that you want to check out. We did things a little backwards from what we usually do. Instead of a beeline to Skyliner, we opted for some Chance Skydiver intensity. It was a great choice, as always. There is nothing like when that ride really gets rotating and you get your cart spinning. I imagine that feeling is similar to what of a fighter pilot feels in the midst of some tight maneuvers. I wish more skydivers were around today. Skyliner is a wicked ride! Easily one of the top few flat rides that I consider to be the most intense. The world's oldest coaster, Leap the Dips, is closed for restorations. Don't get me wrong, this ride is a ton of fun, but my main draw to the park is Skyliner. I could ride that thing for hours. On empty days, they will let you do just that, letting you switch with people who want to ride in your row, or letting you just sit in the train and continually cycle. I think my record on it in a single sitting is somewhere around thirty times. Just some of the work being done. Leap the Dips is a labor of love, like an old hot rod that you have in the garage that you like to fine tune and adjust. They just wrapped up a restoration project on Leap the Dips and it is open once again. Toboggan is a fun ride! One of only a couple operating coasters of its type. This Chance product pioneered the vertical life. Heading down the helix elements is always a ton of fun. This midway has a ton of fun flats. Especially this Eyerly Spider. It runs in beast mode and is kept in top working order with parts that are well greased, leading you to spin for a good minute or so after the ride has stopped moving. The same is true for their tilt-a-whirl. A classic Eli Bridge Ferris Wheel on the left, and the ejector airtime filled Skyliner on the right. Skyliner was running terrific as always. This was our second visit to the park this year. The thing that most amazes me about this ride is how each individual cycle widely varies. On some rides you may get a ton of ejector airtime on one of the hills, and then get some nice floater on the remainder of the ride. On other rides you might get balanced airtime on every single hill, and on others you may get varying degrees of ridiculous ejector airtime on every hill. You have to ride it for a bunch of times straight to see what I am talking about. If you closed your eyes and continually rode, you might almost think you've been on one extremely long ride, as opposed to riding the same course over and over again. This coaster has so much character and it really is a masterpiece. The Philadelphia Toboggan Company's John Allen did a great job designing this ride for the former Roseland Park in the Finger Lakes Region of New York, and Charlie Dinn did a great job getting this rebuilt at Lakemont when they moved the ride. This coaster is tremendously underrated. Brit had to get her goblet pitch game in. She was kind enough to let me take one shot from her bucket, and sure enough, I won! I let her pick the spoils though! As always, Lakemont is highly recommended by us. This is a low-key park to go and relax, and possibly one of the best kept secrets in the industry. Once again, you are not going to get the experience here that you get at one of the bigger corporate parks, but you will get friendly service, a series of rides that are very thrilling, and the makings for a fun afternoon and evening out, for less than the cost of going out to the movies. Today we check out Waldameer. We went on the weekend of Fourth of July and the park was awesome as always. This park is always a great place to go, but somehow they end up improving the park each and every visit. They finished the entrance sign for the new main entry way. To the right you can see the brand new wave pool. There is a slide complex under construction for the little ones that should be a hit. My main draw to the park is always Ravine Flyer II. I am pleased to say that this awesome ride is even better. I've ridden this coaster every year since it was built, and this coaster some how gets better every year. It is flying! Always gotta love the bridge over the highway! I always love the classic midway at Waldameer. Waldameer is always an awesome place to relax. The rides are great, the games are fun, and everything is affordable. Ravine Flyer II is also a world class ride that is a masterpiece. 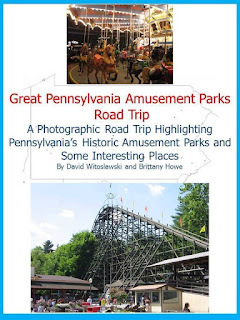 Today we take a look at our visit this past weekend to historic Conneaut Lake Park. It was a warm day and we decided to take a swim in Pennsylvania's largest natural lake and sunbathe on the beach before going and doing some riding. The beach is a delightful place to spend an afternoon. Before hitting up the rides, we opted to play some games. There is nothing quite like a ride on the park's carousel. This Harton carousel is roughly a century old and it is the last of its kind. We always enjoy taking a ride on it. Along with the Devil's Den, one of only two remaining rides of its kind. It was great helping restore this ride a few years ago. The ride operators were having a ton of fun operating this. It is always a treat when you see ride operators excited about their jobs. Now on to the Blue Streak! Gotta wait for the next train! The coaster was absolutely flying, moving faster than I've ever seen it run. You can see how all of the track on the first drop is brand new. They replaced the track all the way from the lift hill to the second hill. Thanks to this work, the coaster flies faster than I've ever seen it go. There was airtime on every hill on the return run. I had never seen it run that well through the second half. Hats off to Lenny Adams and the maintenance team for keeping up this terrific coaster. All new wood through the entire first drop. Additionally, they have the train running again! It took quite an effort to get this ride rehabilitated. This is the first time that we've been able to take in a ride on the train. The course circles the layout of Blue Streak and runs deep into the woods surrounding the ride. I love seeing all of these different angles of the coaster. Additionally, most of these trees, if not all of the trees surrounding the coaster are old growth. The coaster is 78 feet tall, and the trees have at least 30 feet on the height of the coaster. These are some seriously huge trees. Pooh was watching our train ride. I love this turnaround. Low banked turns are awesome. Every hill on the return run was packing airtime. Now for some paratrooping! There is nothing quite like taking some time and riding the different flat rides at the park. Especially the Traver Tumblebug. One of only two of these rides that remain, this is the most powerful of the two. It zips through the circle, proving some decent airtime and lateral forces when it traverses its hills. This was a crowd favorite throughout the day. It is one of those awesome kinds of rides that the whole family can enjoy. It was also great seeing the waterpark spring back into life. The lazy river is operational, and they are in the midst of getting the waterslides running again. The Hotel Conneuat, one of only a precious few remaining turn-of-the-century summer resorts in existence. This park is such a special place. We highly recommend spending a day at this park, swimming at the beach, riding the rides, and just relaxing. This park has steadily sprung back to life over the last six years. Every time we visit, and we usually visit multiple times a year, this place steadily improves. You cannot beat being able to have a day at the beach and be able to pay ten dollars to ride as many rides as you want. This place is both affordable, and a ton of fun. If you plan on spending the night, the Hotel Conneaut has rates starting at just 45 dollars a night, and the park's Camperland is affordable as well. There are also a number of fun attractions surrounding the park, including Pymatuning State Park and more.